Last week I discussed that I have seen Dental Hygienists adding value to their Dental Office and to their own worth in those Dental Offices. And one of the best ways for a Dental Hygienist to add value to her Dental Office is for her to know her numbers. I’m continually surprised when I come across a health care professional, like a hygienist or a dentist, who does *NOT* have an exact idea as to what they need to produce, treat and co-diagnose on a daily, weekly, monthly and even hourly basis. Frankly, going about your dental business in this manner is about as effective as driving your car with the fuel gauge covered over, the clock covered over, and your Sat Nav turned off, *EVERY TIME*!!! But I see Doctors do it, and I see hygienists do it, day in and day out. On the flip side, and I know I’m meant to be tidying up on the last two weeks of valuable hygiene blogs, on the flip side, a dental office with targets and target-focused providers is a safer more secure office to be employed in and is also a safer and more secure dental office at which to be receiving treatment. Because it’s just a well run machine…. it operates well. Take a look at Formula 1 Pit Crews. Can you imagine a Pit Crew operating with no ideas on time frames, efficiencies, goals and outcomes? It would be just an out and out rabble, and mess! If your doctor and your hygienist don’t have a daily number, and an hourly number feeding into that daily number, well the dental office is walking along the precipice of failure and doom. I mentioned last week that the real value of a great dental hygienist for a dental office is her ability to help the dentist in finding defects and decay in the mouths of the patients that she sees and treats. Her true worth is her ability to plant the seeds in the patients’ minds as to what sort of treatment they may need to rectify any such defects. And I also mentioned that a great dental hygienist will have a thorough and complete list of findings ready for the doc on each and every patient, and how having this ready makes everybody’s life so much easier. Over the last twelve months I’ve had the pleasure of collaborating with a specialist hygiene department adviser who teaches dental hygienists how to consistently add value to their dental office by co-diagnosing $6000.00 to $10,000.00 and beyond in dental treatment required straight there and then day in and day out out of the hygiene room. As a dentist, it’s an absolute joy to have a dental hygienist switched on and focused on seeing defects and alerting patients to those defects and best possible treatment alternatives well in advance of my arrival into the hygiene room for the examination. No patient wants to have a tooth crack in an unwanted and awkward situation. A great hygienist will use the intra-oral camera to photograph all areas of concern and bring these images up on the big screen monitors in the treatment room so that the patient is well aware of the extent of the areas of concern well ahead of time before the doctor’s arrival. I can’t tell you how pleasant it is to work in an office where patients are informed of findings and educated on best treatment by the hygiene department well ahead of time. And having a hygienist who operates from a position of assisting the doctor in finding and alerting him in advance re these observations makes life for the doctor and the dental office as a whole, far less stressful. And I’ve seen first hand where these sorts of hygienists and these dental offices are operating successfully. But the dentist needs to be on board as well…..
Because whether it’s the dentist, or the hygienist, or the treatment coordinator, if any one of those three is not working “with the programme” then the programme is doomed. A chain is only as strong as it’s weakest link…and having any one of these three operators with their eye off the numbers, with their eye off the ball, adds unnecessary stress to the whole entire dental office. Producing sufficient dentistry to pay the overheads of the dental office, the wages of the staff and the dentist, and return a dividend to the owners and shareholders should be the primary driver of that successful office. Diagnosing and presenting treatment efficiently and effectively removes unnecessary stresses of needing to attract more new patients. Goals and targets get results. You’ll always hit a target you never have.. If you don’t know where you’re going you’ll always end up exactly there…nowhere in particular…. So get focused, know your numbers, and kick goals! Well structured productive hygiene is one key part of building and operating The Ultimate Patient Experience, a simple easy to implement system that I developed that allowed me to build an extraordinary dental office in an ordinary Sydney suburb. If you’d like to know more, ask me about my free special report. Who Needs Customer Service Anyway? These are some of the comments I hear from time to time as I travel around the globe attending meetings and talking to other dentists. It really is sad that this opinion still exists out there in the profession. And I’m not sure if it’s because of naivety, or arrogance, or obstinance or ignorance? Or maybe it’s all four. Or a combination of some of them. The thing is, all dentists are technically the same. Their skills are equal. Or should I say, our skills. After all, I am a dentist. The profession would like us to believe that Mr. and Mrs. Public should be happy to attend any dentist because all dentists have the same level of technical competency. And that’s why you don’t see dentists advertising their technical points of difference. No, it goes without saying, the public expect all dentists to be of equal competence. So how do you compete in the marketplace for patients? Well maybe you don’t have to. Maybe you’re in a town or city overrun with people and undersupplied with dentists. A town where the public are beating a path to your door, because there’s just not enough dentists around to treat all the people. But that’s not the case, I’m sure. I know down here in Australia, we’re about to see a glut of dentists. We’re importing overseas trained dentists, and granting licenses to them to practice in significant numbers. And for some reason we’ve got a large number of newly formed dental schools across the universities of the country churning out new graduates from their newly formed dental faculties. I think down here the public has a one in four chance of their dentist being either overseas trained or newly trained. So the best way of competing in a market of oversupply is on price, right? Whether we’re talking dentistry or any other commodity, people will always take the cheaper or cheapest alternative, right? A dentist friend of mine espoused that in life, as consumers, we make our choices based upon a triangle of three components. And our choice is made upon a balance, that we choose, of those three things. His belief is that in delivering a product or a service, the supplier cannot be a three times winner. His contention is that at best, a supplier can only deliver on two fronts. To have the lowest price, you have to be compromising on quality or service. And on the flip side, to provide the best quality or service, you have to spend a dollar, meaning that the prices of your goods cannot be the lowest. Which brings us to service…. The level of service that you provide is the only differentiator, or point of difference, that your clients will use to choose you and your dental office, all things being equal. Because quality, from one dental office to another, is the same. And patients in general don’t know the difference between a new laser and an old laser? Or a good crown margin and an OK margin? But patients will know and notice the difference between a dental office providing World Class Customer Service and one that’s just simply going through the motions. And it will only be so long that they’ll put up with poor service and low levels of care before they start to look around for a cheaper dentist who treats them in the same poor way. If you do not have a strong and compelling service differential, then the public, your clients and patients, will just move on looking for the only other differential they know….price! And low price does not breed customer loyalty, in dentistry. Only the provision of impeccable world class service breeds customer loyalty. And loyal raving fans are what sustains a great business. And there’s your differential…your point of difference. Is Your Hygiene Department Adding to Your Bottom Line? Here’s How It Should Be….. The real value of a great dental hygienist for a dental office is her ability to help the dentist in finding defects and decay in the mouths of the patients that she sees and treats. Her true worth is her ability to plant the seeds in the patients’ minds as to what sort of treatment they may need to rectify any such defects. You see, many many years ago, I came into my hygienist’s treatment room to do a hygiene check, or examination, on one of her patients. As soon as the patient opened wide, there, as plain as the nose on your face, was a huge gaping defect on a lower right second molar, where the whole mesio-lingual cusp had been sheared right clean off and away!! Now you couldn’t miss this, because on top of this, the lower right first molar had been previously removed. Like I said, it just jumped straight out at you! Well knock me down with a feather!! Please help me up off the floor as I recovered. What hit me there and then was that my wonderful new hygienist had just been visiting for an hour in this lady’s mouth and had not even raised, asked or mentioned to the patient a question or point or observation that a huge piece of tooth was missing from her body. My wonderful new hygienist had not mentioned or raised the broken tooth with the patient at all. The dental hygienist has such a great opportunity to detect, observe and collect and collate a list of defects and decay that she sees in the patient’s mouth during their hygiene visit. Reinforcing this fact, I received the comment below from a colleague, Kristin Nickells, following on from her reading last week’s blog post, Is Your Hygiene Department A Profit Centre? As Kristin points out, the hygiene visit is a great opportunity for the hygienist to alert the patient to those things that she sees that she is going to bring to the attention of the dentist. Because let’s face it, she’s in there for such a long period of time, and has the trust of the patient. So it makes good sense for her to act as the doctor’s second set of eyes, so that when the doc comes in to do the examination, the hygienist can have a complete list of defects and spots that she wants the doc to pass opinion on. After all, the hygienist is a dental professional. An educated dental professional. And patients do trust her. And she does know what decay can look like. And a crack. And a margin deficiency. So there’s no reason at all, why during the performance of her hygiene duties, that she can’t alert the patient to a list of things that she’s seen that she thinks the doctor will need to check. Because we know, that there are some parts of the world where dental hygienists cannot diagnose…. But they can ask the doctor to review some things that they’ve seen..
A great dental hygienist will have a thorough and complete list ready for the doc on each and every patient. And this makes everybody’s life so much easier. Next week I’ll discuss some absolutely brilliant ways that I’ve seen where a hygienist can even go Above and Beyond for her patient and for her Doc. Why We Must Always Be Valuing Our Customers’ Time. One of the simplest ways of showing anyone that you care about them is by showing them that you value their time. With children it’s simple. It’s done by spending time with them. I remember being told as a young parent, that children spell love, T. – I. – M. – E..
With adults, it’s the same thing. When talking with someone, we need to *BE* with them, really be there for them. Not just be there, but be present. For them. With customers, clients and patients its that, and one step more. With customers, we need to be there with them, and be present for them, but we also need to be mindful of *NOT* wasting their time. Think about it…. as customers ourselves, in business, in retail, we dislike being kept waiting. We dislike being left unattended, when someone could be there serving us. And it can be the same in dentistry. This month, we’ve had a dental assistant sent to us from the agency, to fill a position we’ve had come up due to the recent departure of a team member. She’s a good girl, works well, but she’s come from a job elsewhere where she worked full time for over four years. What’s interesting about this is that though she’s proficient in a lot of aspects of dental assisting, we’ve had to talk a few times with her about time, timing and time management. What surprises me about this, is that what it really means is that where she used to work, they must have had very little idea about the better use of everyone’s time, and the implications and consequences of not valuing and respecting the time of the patient and of the doctor. It’s my belief that in the modern day Dental Office there are three types of measurement of time. And they must be valued in that specific order. With only slight separation of #1 and #2. With this hierarchy in mind, everything that is done in the dental office must be done with due consideration of these three types of time. At the completion of a treatment appointment yesterday, our dental assistant left the operatory to return some product we had used to its refrigerator. Unfortunately, although treatment had been completed, the doc and the patient were left stranded and left hanging for a short awkward moment. You see, the DA was really required in the treatment room to assist with the post treatment restablisation: Warm towel, fresh water, bib removal, safety glasses removal, return to vertical familiarization, face and clothing correction and straightening etc. Although the product did need to be returned to the fridge, it didn’t need to be done right at that instance. It could have been done after the patient had been escorted from the treatment room. The same goes for other “putting away” activities during the appointment. These must only be performed after the patient has left the treatment room. Not while the patient is in the treatment room. It is the dental assistants duty to *be there* for the doctor and the patient, and not to be putting stuff away. Putting stuff away distracts us from serving our clients and from being *of* service to our clients. Putting stuff away must always be done after. It’s very difficult to begin an appointment on time, or to catch up lost time, if the next patient to be treated is left waiting outside in the client lounge as opposed to being brought down into the next treatment room on time. And once brought down, they need to be prepared, and be attended to by the dental assistant, who must stay with them. On occasions this week, I’ve seen patients being left unattended in a treatment room, and we all know what that’s like…Time alone seems to take an eternity. The time spent alone, waiting, is heightened. As mentioned in previous blogs, this valuable time spent waiting for the arrival of the dentist can be used to engage the patient in meaningful conversation about the patient, gathering information [discretely] about them and just “visiting” with them, talking to them about their favourite subjects and interests. It also means that when the dentist arrives, its straight down to treatment, with no waiting. Again, we are valuing the client’s time by being proficient and efficient with their time. Then there’s timing. Or time-ING. Answering the call of nature sometimes needs to be planned by the dental team where it has the least impact on the roll out of our dental product. And this comes back to the respect of other’s time. Doctor’s time, patients’ time, staff time. Think practically. When it’s patient time, let it be patient time. Be ready for them, and be ready to be there for them. Finally, set-ups. Tray and treatment room set-ups. These need to be perfect, each and every time. Because if one thing’s missing, it may as well be five things missing. Everything grinds to a halt while the missing items are gathered. And to me that’s just plain rude. I know it’s not the end of the world, but time is our greatest resource. We all, be we Trump, Murdoch or Branson, we all have exactly the same amount of time. Be mindful of it. Be respectful of it. Count it. Measure it. Because once it’s gone, it’s gone…. The Best Use of Time is just one of the many protocols you will learn in The Ultimate Patient Experience, a simple to build complete Customer Service system in itself that I developed that allowed me to create an extraordinary dental office in an ordinary Sydney suburb. If you’d like to know more, ask me about my free special report. Is Your Hygiene Department A Profit Centre? I was recently discussing with one of my clients the decision she was having to make as to whether or not she should begin employing a dental hygienist. So we started doing the math. And that made the decision easy. Firstly, we categorised all the patients in the practice into six categories. The key metric that we took from doing this exercise was that, for this question, we were looking for how many patients of record would we consider to be regular attenders of the practice? These patients were then divided into those who had been coming for more than three years, and those regulars who had been coming for less than three years. We then looked at the actual number of teeth cleaning appointments that had been performed in the last three months by the doctor. Thirdly, we looked at how many new patients were coming to the dental office on a monthly basis. The number of regular patients, multiplied by two and divided by twelve, equals the number of regular preventive care hygiene appointments that the new hygienist would see in a month. The number of new patients who book for a check up per month [already] becomes the New Patient First Hygiene appointment number for the month. Adding these two numbers and dividing by nine [hours in a day] gives us a number of days in the month a hygienist would be required. Having arrived at that number, it was just a matter of then working out whether or not to stretch to a full time hygienist immediately? Dividing that last number by two [because our doc was performing thirty minute hygiene cleans and our hygienist would perform hourly appointments] gave us an idea of how much time we were going to create each month in the doctor’s schedule so that the doc could then see more new patients, and also do more productive procedures as well. So David, I’ve heard that hygiene should be a loss leader for the Dental Office? Categorically, I say this is a thought that no dental office should ever entertain. A hygiene department should be a profit centre for the Dental Office. Try these numbers…If every patient seen in the hygiene room has two bitewing radiographs every two years, and comes to the dental office twice a year for hygiene, then the hygienist should be easily able to set a daily goal. Gives us a daily hygiene production goal = $2115.00 per day. Multiply that number by days per month, and then by twelve to arrive at an annual hygiene production number for that hygienist. 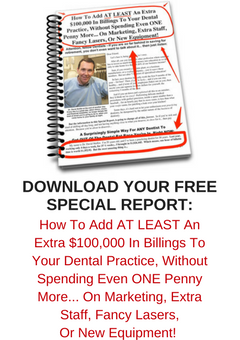 Based on these numbers a good hygienist working four days per week should generate over $36,000.00 in fees out of her room per month. And there’s a good starting point…. Run your numbers through this equation and let me know what you come up with.